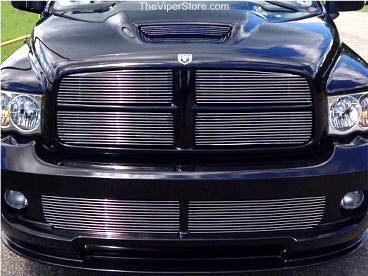 These Grilles match your center factory Grilles exactly! 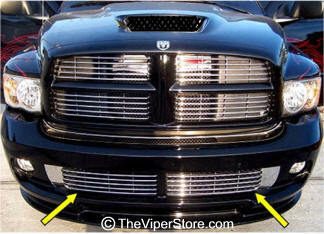 Matching Lower Grilles for the bottom air intake on the RAM SRT-10 front end. Matching Hood Scoop Grille included. Made from high tech automotive chromed ABS resin. See picture where yellow arrows indicate the three grille parts included. 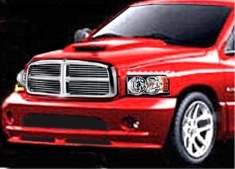 NOTE: Two lower grilles are Not available for the RAM SRT10 2006. This item is a custom order and is not returnable. 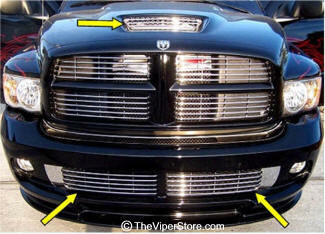 Matching Lower Grilles for the bottom air intake on the RAM SRT-10 front end. Hood Scoop Grille not included. NOTE: Not available for the RAM SRT10 2006. This Grille matches your center factory Grilles exactly! 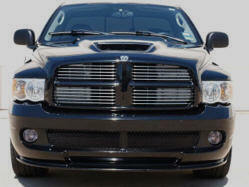 Center hood scoop grille on the RAM SRT-10 front end. Easy installation. Made from high tech automotive ABS resin. 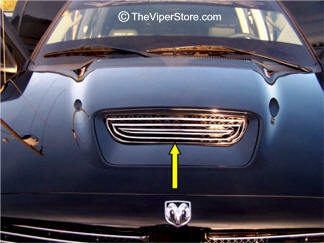 See picture where yellow arrows indicate the three grille parts included. 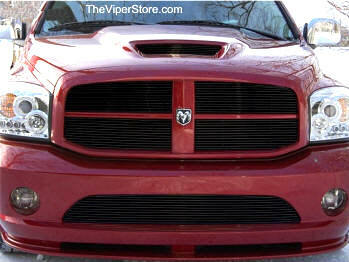 Will fit the 2004, 2005, 2006 RAM SRT10 Hood Scoops. 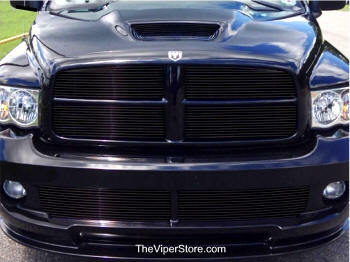 High Quality billet aluminum grille set. Designed to overlay on to the factory grilles. Comes in high polished or brushed aluminum or powder coated matte or glossy black. Includes cable ties for mounting on top factory grilles. 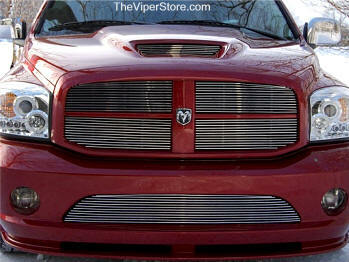 High Quality billet aluminum grille set. Designed to overlay and/or replace factory grilles. Comes in high polished or brushed aluminum or powder coated matte or glossy black. Upper grilles Includes cable ties for mounting on top factory grilles. Lower grilles replace factory grilles. Give your vehicle’s front end a unique and custom look. 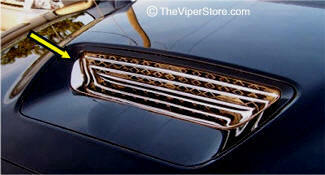 Chrome plastic grilles and front end appliqués help enhance vehicles aesthetic appeal. All parts meet or exceed DaimlerChrysler standards for pitting, pealing, cracking & or blistering.